It’s no secret that I’ve been obsessed with The Wizard of Oz since I was a very little girl. While filling out a postcard with the lyrics, “And the dreams that you dare to dream really do come true,” felt inspired to do a painting, but Crochet has really taken off for me as a chosen craft. It comes to me much more organically than drawing or painting. Originally, I had the idea of painting a background, then attaching crochet to it. As I went along, I decided I a full crochet “painting” was what I wanted to do. Completed piece is approximately 11×14 inches. Very creative, and like you, I TOO love and have loved since I was little, the Wizard of Oz. I waited impatiently each year for the movie to come on. Now, just plug in a DVD! Wow, how far we have come! 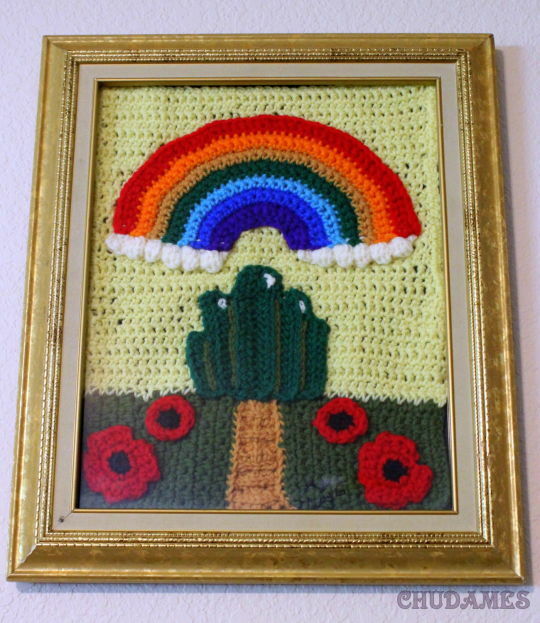 I like the idea of a crochet “painting” and will have to try it with something in the future. thanks for the idea and for sharing your awesome painting. Thank you! Right? It’s a well-loved classic. :) I look forward to seeing what you come up with!